I understand why some people give up on golf far too soon—before they develop a passion for the game. It challenges even the most seasoned players, requires lots of practice, and can be quite costly. For instance, Callaway’s Great Big Bertha Epic driver will set you back $500. If you want to put the club to use on a prestigious course, such as Shadow Creek in Las Vegas, you’ll have to pay another $500 for green fees. But there is ample opportunity to contain costs. You can purchase less expensive clubs; and you can play public courses in hometowns like mine for $15 a round. So considering that the financial outlay can be reasonable, I believe it’s basic intimidation that most often squashes love for the sport before a devotional spark has the slightest chance to ignite. Understanding the truth about golf may help you approach the sport with greater affection. Golf Truth #1: It takes skill to get that little white ball flying in the air. Practice. My first golf experience was with friends during high school. Mark was the only one of our foursome who knew how to play, and he was a patient teacher to the rest of us. Margie, Lisa, and I were athletic, so Mark probably thought we would easily learn this sport too. But taking three beginners out on a course is not the best way to introduce newbies to the game unless you’re looking to play the longest round of your life. Because Mark was dating Margie, I think he was okay whiling away the time. The girls and I struggled to transform our softball swings into anything useful. Heck. We would have just liked to have gotten out of the Whac-A-Mole ground-pounding mode that was beating our confidence into oblivion. We were A-W-F-U-L. So bad that I’ve blotted out most other memories of that day. But there was that one shot . . . when I struck the ball just right. It didn’t roll across the ground like it had every other time I hacked at it. This time it took flight, sailing skyward. Personal triumphs, like lofting that little white ball for the very first time and sinking a pitch from seventy yards out, are what keep us golfers coming back. We hit the driving ranges and work on our long game. We find our putting strokes on the practice greens. And we test our fortitude by chipping out of six-foot bunkers. We want to emulate the pros, who make it all look so easy. Golf Truth #2: It takes positive thinking (and an impressive outfit) to build a good game. Believe in your ability (and wear something that boosts your confidence). 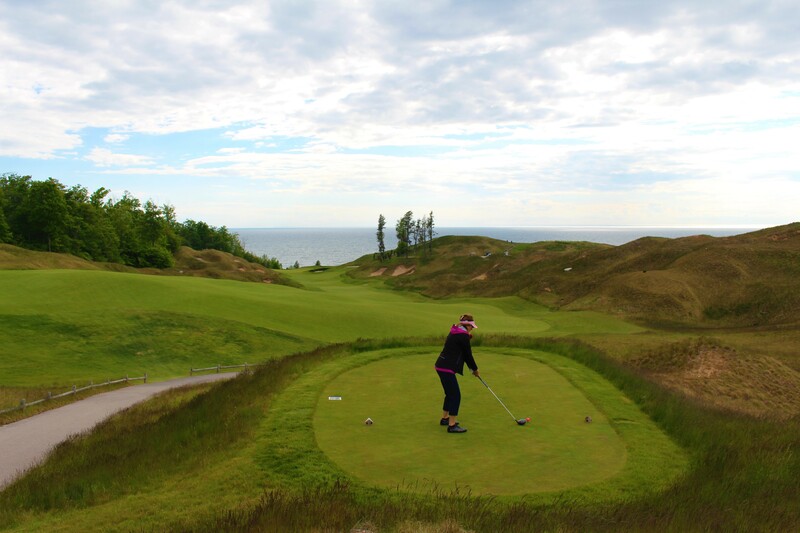 The view of Lake Michigan from Arcadia Bluffs is as spectacular as the golf course. Arcadia Bluffs is the number one ranked course in Michigan, where my husband booked a Memorial Day afternoon round for the two of us. That springtime day in The Great Lakes State was partially cloudy and projected to reach sixty degrees at best—chilly for me. If I had my way, all golf days would be eighty degrees and sunny, but northern Michigan isn’t known to bend to my will. So, I dressed in five layers of clothing to help me deal with the brisk air and fluctuating winds that would make the atmosphere feel ten degrees colder. Trust me when I say that it wasn’t easy deciding on all those layers. My slacks and shirts were running a bit tight at the time, and I refused to invest in new pieces of clothing to accommodate my expanded waistline. I was counting on losing the ten pounds I kept complaining about. I opted out of getting a propane heater for the golf cart even though I was shivering. “It will warm up,” I hoped. Standing beside our cart and waiting for our tee-time, Greg and I admired the seemingly endless and beautifully blue Lake Michigan, lying beyond the grassy bluffs and rolling terrain of the course. The view rivals that of Whistling Straits in Wisconsin, whose own gorgeous shoreline constrains the massive freshwater lake and prevents it from inching farther west. There were several groups of men on the grounds but no women that I could see until a couple came in from their round. The model-gorgeous young lady loudly talked about how pleased she was with her 46. Whether that was her score on the front or back nine, I didn’t know. I was sizing her up and observing how attractive she was in her stretchy, black, Nike golf pants and matching jacket. Black is a great choice when you want to look slimmer, but she didn’t need the help. I wondered how she could possibly have been warm with so little to wear. 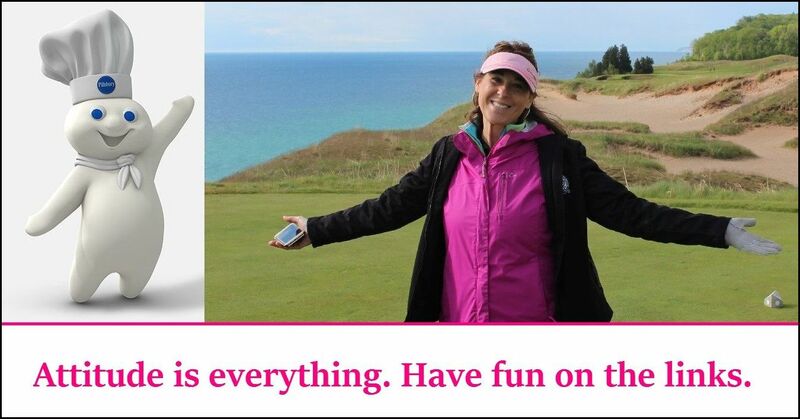 The only other woman on the course, besides me, looked like an expert—as if she could appear on the cover of Michigan Links Magazine. I compared myself to her and realized my silhouette resembled that of the Pillsbury Doughboy, plump and round. I wore a black sleeveless golf shirt just in case the temperature rose; a long-sleeved pullover because I was pretty sure it would not; and three jackets of varying thicknesses for extra protection. So, there I was: at a mental disadvantage for golf because I didn’t feel comfortable with my weight, let alone with what I was wearing, and I had never golfed a 46 in my life. Whether blessing or curse, the sky released a downpour. It wasn’t supposed to rain. Greg and I rushed into the clubhouse to see the storm cell on radar and ask the pro-shop attendant if we could delay our start because of the wet and cold conditions. Ideally, the rain provided me with the opportunity to change my negative mindset and prepare to golf my own best game. Overly-critical thoughts about ourselves can have disastrous outcomes in golf. Adversaries trash-talk to mess with our heads and destroy our confidence. We shouldn’t crush our own spirits with self-condemnation. Knowing this, however, didn’t prevent me from beating up my real opponent before she had even taken her first swing. Greg and I got a reprieve. The storm cell moved quickly, and there was a half an hour before another group was scheduled to tee-off. With no one pushing us, I expected to be able to relax. We teed off, and I plowed through first-hole jitters by hitting a decent drive. Still, the ambiance of the exceptional course overwhelmed me. My next shot landed in a seven-foot-deep bunker and I had trouble chipping out. I took a nine on the first hole and berated myself for the embarrassing start. My focus during the next few holes was just as much on the mental battle I was having as it was with the physical trial to strike the ball well. Once I gained control of my nerves, I began to see good results. The day progressed, layers of clothing came and went, and I shot a 100 for the round. Overall, not bad. I celebrated by buying a black and white, stretchy, athletic jacket and vowing to start my diet the next day. Golf Truth #3: It takes knowledge of the sport to earn respect from other players. Study. Even if swinging a club and striking a ball comes naturally, we need to acquaint ourselves with the rules governing play. Otherwise, we won’t make it past the driving range without alienating ourselves from seasoned players. They may forgive innocent mistakes made by beginners, but they have little tolerance for ongoing rudeness. The Rules of Golf are long and daunting, and I’m not sure anyone knows them all by heart. Even golf’s greatest pros sometimes ask for clarifications from officials. The rules book is commonly tucked into golf bags and pulled out during competitions. But it rarely sees the light of day during more relaxed and friendly rounds. If we care about the spirit of the game, and we should, we’ll grow in our comprehension of golf’s long history and honor the sport through fair and honest play under all circumstances. Golf’s two governing entities want to make the rules easier for golfers—of all levels—to understand and apply. The United States Golf Association and The R&A hope to achieve this goal by revising the rules. This is a unique opportunity for those of us enamored with the sport to directly influence the game by reading a draft of the proposed rules and providing feedback by August 31, 2017. Our suggestions could be the ones that are settled upon in the finalized rule book, expected to take effect on January 1, 2019. Golf Truth #4: It takes patience to find the swing and strategy that work best for you. Pace yourself. Watching a video of me hitting my driver, I was surprised to see how slow my backswing is. I’m tempted to swing faster but worry that I would lose accuracy with the change. It’s not worth that risk to me. There are other areas of my game, like putting, that I can benefit from improving instead of a major overhaul in my long game. Being in a hurry on the course can be as big of a mistake as letting intimidation influence our confidence. The last time Greg and I were being pressed by another twosome, he and I evaluated our pace of play. We were coming in under time, as designated by course policy and indicated to us by the starter at the beginning of our round. As such, we could have defiantly held our ground and made the twosome wait at every hole. But the pace of play rule indicates that we should allow faster players to play through. This makes perfect sense, doesn’t it? Why deal with tension if you could instead alleviate it by simply being polite? In our case, Greg and I waved for the guys to move past us and then patiently waited as each teed up, swung, and sent their shots flying forward. We watched as the second golfer searched for his ball 100 yards farther from where it was actually lying. I felt really badly telling him that his ball never made it past the forward tees. Haste makes waste, as the saying goes; and in this case, a hasty swing off the tee made for a bad shot. So yes, it takes time and commitment to develop a love for golf. You need to approach it like you would any other relationship. Get to know its history. Who are the greats that loved it first? Regularly focus your attention on it. Is one night out a week too much to ask? Invest in it. How much better could the two of you get along if equipped with the right tools and some counseling? Shake off the tense moments and bad results. Can’t you just see how spectacular you are together too? Control the way you think and behave, and soon you’ll be head over heels in love. Kelly, I enjoyed reading your blog about golf truths. I’ll have to remember those truths when I return to the game. Thanks, Barbara. I hope you play again sooner than later. Well, since I love the game but don’t play it nearly enough to be good, I loved this blog. You are right on with everything. The apparel makes me laugh. I love dressing the part but that game is insane! Would love to go play a few rounds with you.